After his successful return to the Taiwanese television industry after completing his military service, Taiwanese actor Roy Chiu (邱澤) is shifting his attention to the film scene with his upcoming movie, Good Luck! Boy <加油！男孩>. Scheduled for a release on October 25 in Taiwan, Good Luck! Boy will mark Roy’s first leading role in a feature film. Good Luck! Boy will feature Roy as Ah Ze, a fraudulent music expert who is forced by his uncle to write a theme song for an upcoming concert. He discovers that the concert’s venue, an old sugar mill, is scheduled to be torn down after the event – which dismays him because the sugar mill holds precious memories and dreams from his childhood. As he works to perfect a theme song in order to convince the higher-ups that the mill is worth preserving, he must discover for himself the beauty of a place that others might consider worthless. Although Roy has had undeniable success in both Taiwan and mainland China, with leading roles in high-profile idol dramas like Office Girls <小資女孩向前衝>, Waking Love Up <愛情睡醒了> and the upcoming Wine Beauty <紅酒俏佳人>, his film experience has been much more limited. The first two movies in which he participated were not even cleared to air, and his latest film role was a voice acting position in 2011, when he dubbed the lead character in the Chinese version of Arthur Christmas. For an artist accustomed to the television industry, Good Luck! Boy is a valuable opportunity for Roy to shake off the “idol actor” label and try his hand at a different medium. 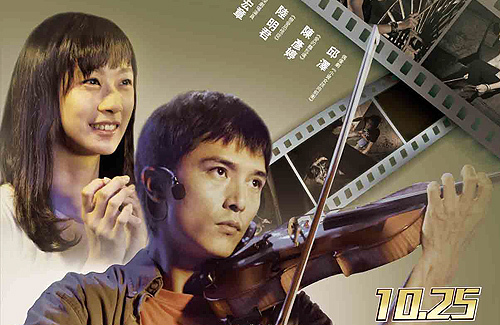 The film’s musical focus should be a plus for him as well; although Roy is not a professional violinist, he is skilled at both singing and playing guitar. Moreover, he has released a handful of albums. With luck, Good Luck! Boy should be able to further both his acting and musical aspirations, as well as present fans with a welcome mixture of both.